A NAMIBIAN company has partnered with an Angolan company that runs a textile plant to supply cotton to them. Ohangwena Cotton Production is a Namibian company based in the northern regions, and has been in operation since 2017. The company will be boosted by an investment worth N$238 million from Alassola SA, a textile plant in Angola. The two companies signed the cooperation contract yesterday in Windhoek. Ohangwena Cotton Production will be supplying Alassola SA with 9 000 tonnes per annum. The Namibian company called on the government to provide them with the land for cotton farming. Ohangwena Cotton Production founding director Dasius Nelumbu said the contract will enable them to earn a minimum of N$1,2 billion in revenue per annum. However, until such time that they have sufficient farmland, they would not be able to sign more contracts with other entities. Although they are starting small, Nelumbu believes the new projects will provide permanent jobs to about 1 650 people. "The agreement signifies what we may term the birth of a new industry in Namibia, as the idea from field to fashion is a concept which contributes towards value-addition," he added. According to Nelumbu, Alassola SA will offer N$238 million to Ohangwena Cotton Production, and in return, they will supply clean cotton. He added that Alassola SA would also provide them with technical support in cotton farming and ginning. "Their processing factory, which makes fabric, is open to us for visitation in our quest to increase the knowledge we have in the cotton value chain," Nelumbu said. 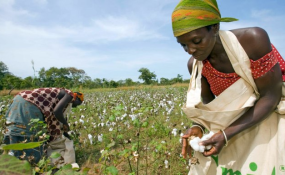 The chief executive officer of Alassola SA, Tambwe Mukaz, said as a textile company, they process cotton which they transform into finished products. "We find this project exciting by its size, and also the fact that it will be produced in the Ohangwena region, which is very close to Angola," Mukaz noted. He added that they would be facilitating transportation, as cotton is a primary product needed in their industry. "The reason we chose Ohangwena Cotton Production is that we want cotton of high quality, and our industry uses high technology," Mukaz said. Inasmuch as Namibia is to benefit from this project, Angola will also benefit due to new employment opportunities created in the process, he enthused.